Noodle is served on small plates. 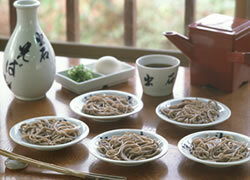 Izushi-soba is served on small plates and you can try to eat them as many as you want. One portion is served with five small plates. They are served with dipping sauce made by dashi (Japanese soup stock made from fish and kelp) and a choice of spices to add in the sauce. It is said in Izushi that if you are able to finish the plates and lay them up as high as the length of a chopstick, then you have eaten like a grown up man. Each shop make efforts in making their original dashi sauce with fine quality stocks. Izushi is known for its rich dark dashi made with bonito flakes and dried kelp. Pour dipping sauce in a bowel, then firstly enjoy the taste of sauce. Put noodle in the sauce then eat the noodle. Add a raw egg and grated yam in the sauce. You can enjoy another flavor. When you are finished your noodles, you can drink sobayu (the hot water in which the soba has been boiled) like a tea to enjoy after flavor. Sobayu is meant to be poured into your remaining dipping sauce after you have finished your noodles.